When I signed up for CS50x I assumed that I was in for a rigorous Harvard course, and I was, but I had no idea how much fun I would have, and how much of a community experience it would be. As with any other edX.org class, I signed up through the edX.org portal. I then watched a series of lectures, by the most creatively informative professor you could ever meet, David Malan. These lectures were not like the MIT course, they were not five minutes long, they were not made for the online course. These were recordings of the lectures that actually happened at Harvard in Sanders Theater just a week prior. You can see the 2012 lectures here. We as online students were a week behind the actual class, and our online forum was the same forum the students on campus used. I can't express enough how exciting that made the class, With MIT's 6.00x the goal of the class was to teach you how to code in order to do science. On the other hand, CS50 is an introductory course designed to teach you computer science in the most fun and approachable way possible. The teaching staff was also amazing. Robert Bowden, Zamyla Chan, Tommy Macwilliam, and Nate Hardison changed my life. Robert Bowden is the reason I know what a Hashtable is and how it works. Nate Hardison is why I know what a Linked List is and how it works. Zamayla Chan is the reason I didn't run screaming from each homework problem set. Tommy MacWilliam is the reason that I am comfortable with Trees. As to assignments there were seven problem sets and two quizzes, not including Homework Walk Through's, Video Shorts, and a Group Lab session called Section. All homework was checked and uploaded via what was called The CS50 appliance. The CS50 appliance was a Virtual Linux OS image that you ran through either VMware player or Fusion or Virtual Box. 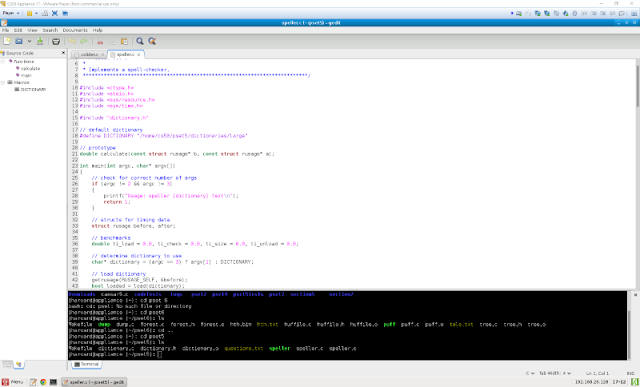 This Linux environment was where we learned to code in C. C is a very unforgiving language and that is why its perfect to begin with. Having come from python's almost non-existent syntax, the idea that I had to load the array myself and make sure to allocate the memory for it, was offensive. The syntax better be right or the compiler will yell at you. This infuriating stickler of a language made every tiny success huge. Once I got comfortable with C, all the fear and intimidation that come with not having a programming background disappear. (Well, I started with basic in 1986 and...it didn't work out.. that's a different post :-) ) All of the sudden, climbing the seemingly complex mountain of Code and API's needed to create anything seemed completely doable! If you are afraid of not being able to learn to code, CS50 is the class for you. CS50 takes away the fear, and turns it into just work. CS50x has continued to evolve and is now larger and better than ever before. Code can be hard, algorithms can be hard, but at CS50x the encouragement is 100%. I met people online taking the course with me from Pakistan, Canada, New Zealand, and Thailand and we still talk to this day. Yeah, I loved CS50x. Its lessons still serve me. What would you build, if you weren't afraid to fail? Take CS50x and find out! In 2012 word got out that Major Universities would be offering online courses for free with some sort of certificate at the end. I jumped at the chance to really see what I could do. So in October of 2012 I signed up for EDx.org, then a joint venture between MIT and Harvard. This would be my first online MOOC (Massive Open Online Course) and I was excited. I had 2 classes in mind to take, 6.00x through MIT, and CS50x through Harvard. I always wanted to learn to code, but it never worked out, there was no internet at the time, and I had no one I could ask questions to, but all that was about to change. To be honest, I had already been watching the videos for 6.00x through MIT's Online Coursework. 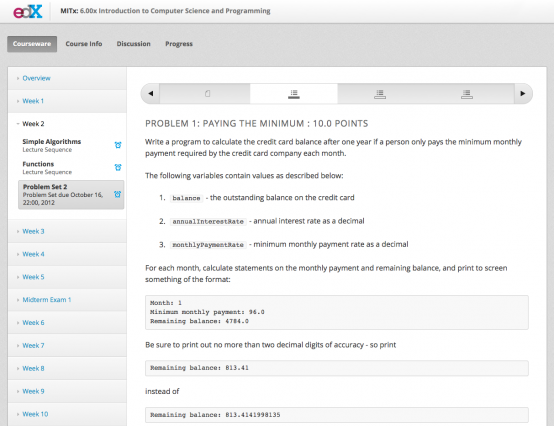 A program designed to allow anyone to virtually audit any MIT course. edX now allowed you to participate, not just watch and receive credit for you work (although not college credit.). I needed a new career and frankly cannot afford an online college. There are 115,000 janitors with BA's and I am a member of that statistic. http://www.bloomberg.com/news/2012-06-17/end-u-s-student-loans-don-t-make-them-cheaper.html , but now I was in a class at MIT. (albeit virtually, but who cares?). This course is strict. The deadlines are the deadlines and you better have it done when its time to turn in your problem set or you get a zero. I was honored to comply, because I knew that the in-class students had the same rules, but I also work 60 hours a week as a janitor, plus I have a wife and two kids, so something has to give. So sleep gave in, no more sleep. I had something to prove so I was up for it. 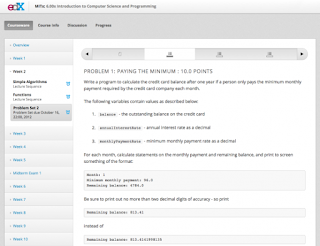 6.00x is a flagship course on edX. As such this course has very tight integration with the edX online software. Everything is built in to the website with the exception of the Python coding environment. That is a simple download. The class is broken up into a string of small 5 minute lectures followed by practice exercises. I dug in. The language we were taught was Python. The advantage was that Python does not require braces or semicolons, just indenting 4 spaces. It does not require types to be set either, just when casting. It is then easier to read and looks more like shorthand than computer code. The fundamentals of variable assignment, lists, sets, dictionaries, and loops came rather easily, but MIT's course is not just about how to code, but rather how to use code do science. That essentially is the function of this course. Learning to use code to do science. In the practice exercises you are asked to code a solution in the web browser and submit. If you succeed, you get a green check, fail and you start over. You are not alone though. There is an online forum where students can learn from each other and get help. The instructors and teacher's assistants also jump in to help. I cannot express how amazing it was to connect with people all over the world through this platform. If the class faltered, those students who are actually software engineers speak up to help. This was overall a challenging experience not because of the code taught, but what you were asked to do with it. I passed the course and got my certificate, but it was not without blood. This teaching approach I would call framework style. They give you the rough outline, but its up to you to figure it out. This is what happens in the real world, I'm sure, but in the real world you can ask more questions, and online you can't. Its a puzzle you have 30 min to solve it: go! All in all it was an honor to take the class and in the end I learned far more that I had in the past about algorithms and code. More than that, I now had command of a powerful popular language, and after the MIT course, I wasn't afraid of much. But I signed up for two edX courses at once, and I still had to complete CS50x. Would I make it? Would the next intro to computer science course be the same? I Have been on blog hiatus...... learning to code. I have discovered the power of Edx. Online Education. My life will never be the same. This is my story. In order to show the power of online higher education in people's lives, you need to see an example from someones life . Below is the story of my education. It is not the worst story in the world, but it is far from the ideal that it pitched by politicians. When I was very young (pre-school) they were concerned that I was behind other students. In truth, I was bored. When I was in third grade they decided that I was so advanced in reading that I should not be reading books for little kids, they decided that I should be reading "Anne of Green Gables". Yeah, I could read that, but why didn't they pick "Lord of the Rings"? A year later they gave me a test that they said proved I was a genius. (I then assumed that if you could read "Anne of Green Gables" and take a test, you were a genius) As a result of that I could stop going to regular school and go to the GATE program school. "Will I be allowed to skip grades?" I asked. "No." they said. "Will I be allowed to do advanced things?" I pressed. "No." they said. "Is there anything new at all?" I asked. They explained, "No, its your regular school work, but we will give you more of it." "No, thanks" I said. From that point on, they then decided that I was dumb as a box of rocks. To combat this, my mother put me into summer school before my first year in middle school. (free babysitting had nothing to do with it) Here, I was allowed to take any class I wanted. So, I took pre-algebra, computers, and science. They said that any credits I earned in summer school, would count the following year. To my surprise, when I received my new schedule for middle school, it was....plain. I was denied algebra or geometry and given remedial math. I was given the same science course (with the same teacher from summer school )-again. (Although I should mention I was soon transferred to the same science class with a different teacher.) This made no sense as I got an A or B in every class. My mother and I went down to admissions to clear this up. I was relieved to find out that they said I had never attended summer school so there was no mistake. I put my head down and went to class. In class I discovered lots of other students with the same problem. My math teacher in fact tried to make us feel better by telling us that this was for our own good to reinforce what we had already learned. We were screwed, but at least we were together. So then we were all screwed. Great! When I got to High School I was finally allowed to take "pre" -algebra. I aced the course to the point that I was tutoring other students in the class and did not need to take the final. They then put me in a competition for "pre"-algebra. I was number 1 in the school and number 3 in the state in my course level. From this point on they again decided that I was a genius. (Apparently a genius is one who aces a course after taking it twice, can take a test, and can read "Anne of Green Gables") I was allowed to take Honors classes. I only took honors Physics. They had wasted too much time for me to take AP math or English courses. By my sophomore year, I had enough of what they said. I decided that High School was a waste of time and went to "test out". They then informed me that the "tests" were only given once per year and I missed it. I put my head down and went back to class. I graduated High School and never bothered taking the SATs or ACTs After all, what would they say then? Plus my parents were poor and I didn't have any money to go to collage anyway. Its not like those tests are free. As a janitor, I worked my way through junior college and eventually received a BA in Theology. I picked theology because I wanted to impact the way people think. A person's theology is a good indicator of that. but that is a different post. After all, they don't pay attention to janitors or theology degrees anyway right? The "they" in my story is the Education system. You see I had wonderful teachers that were very good at explaining ideas, inspiring students and helping them excel. The system on the other hand is not designed to allow everyone to advance, but only a few lucky ones. Somewhere along the line I believe most students give up at the thought of trying to excel and make peace with what they think is possible for them. College placement then, boils down to the motivation of your parents or their income level or both. You see, Economic Discrimination is perfectly legal and the hallmark of the current education system. There will never be enough scholarships for all the students that want to go. As such, for most the idea of going to Harvard, MIT, Stanford, Berkeley is akin to winning the lottery. Its for rich people who are geniuses. (whatever genius is) Or maybe just for rich people. The system is about to change: Enter www.edx.org. See part 2. OK, so being that I really liked Outlook and all its interconnected glory and that I, like many users, wish that Outlook Web Access was a free service, I jumped at the chance to try outlook.com. Outlook.com is Microsoft's update to the popular Hotmail email service. It is packed with Skydrive support among other cool features. So I log in, and what do I see? A new mail screen! BUT........I have seen this before. Hmmmm. Its the Metro Mail app from Windows 8! And the People app and the Calendar app and of course Skydrive. 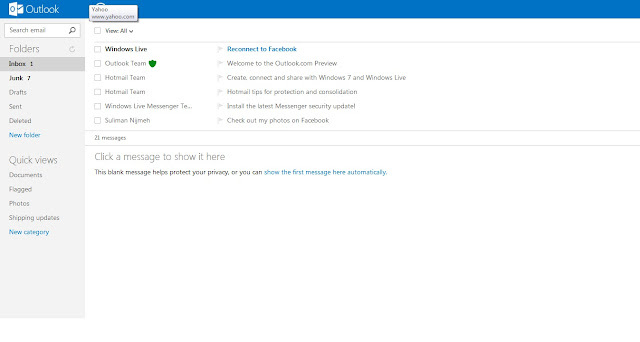 So then outlook.com is a trick to get you to use the new metro apps in Windows 8. These new apps are functional and efficient but nowhere near the level of Outlook. Plus what was one app is now three and then there are the colors.....its like an AT&T Wireless commercial. It seems Microsoft has confused "thinking outside the box" with actually jumping into another one. 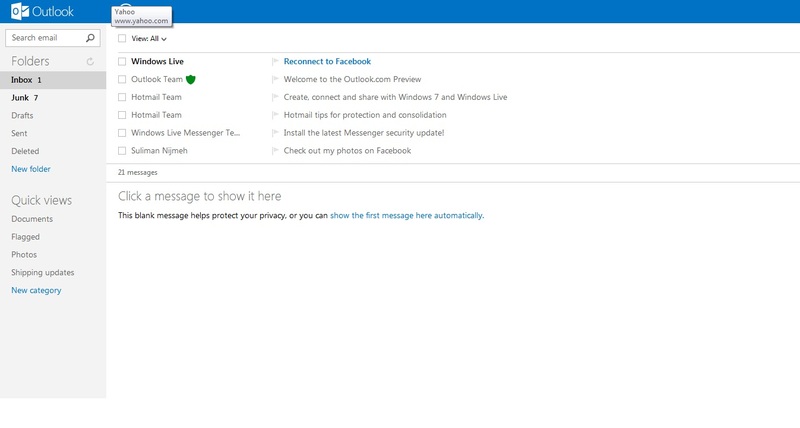 So enjoy (or not) the new Hotmail interface. So I have been on hiatus from blogging....Why you ask? I installed Windows 8. (insert bad words here) This issue is so big I cannot address it in one post. This is part one. Part one is about what Windows 8 is as an operating system. I will not rant about my calamity with Windows 8. I will instead address first the mindset Microsoft seems to be working under. Followed by the brilliance of Windows 8 and the stupidity of Windows 8. To be fair, there are many positives to Windows 8. There are also many poor design decisions. Yeah, I can defend that. Read on. But first, Microsoft's basic assumptions as it seems now: As gleaned from, the MS building Windows 8 blog, and the user experiences (of Windows 8 Consumer Preview and Release Preview) of myself and many other bloggers and journalists. 6. Pretty is more important than functional. 8. Minimalism is the best way to be functional. 9. Computers are used to mostly update Facebook and watch Netflix videos from the cloud. Oh, and listen to Pandora. 10. All computing will be done from the cloud. Now, To be fair, Microsoft is not the only company to embrace the assumptions above. Google has embraced at least some of these and so has Apple. It is a flawed line of thinking that mostly comes from really bad analysis of sales figures and other empirical statistics. Statistics being the most popular form of empirical data that can be made to support the opposite of what is true. CEO's will then say the "data doesn't lie." Which is true of the data, but not true of the statistical analysis. Politicians and Advertisers love statistics for that reason. That, however, is another post. 1. Metro UI is a great Idea! The Metro UI is embodied the new Start Screen. 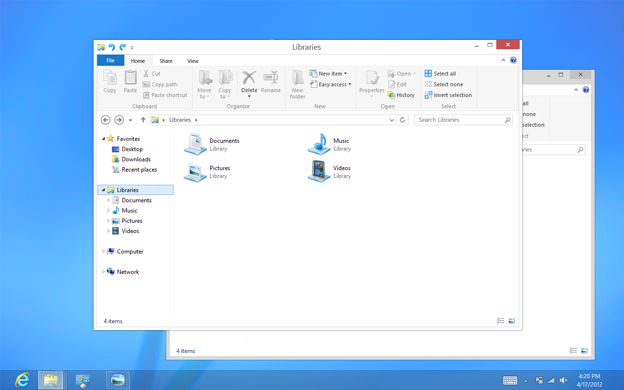 It goes like this: The Start Menu is replaced by the Start Screen. Icons and Widgets become one and the same in the form of tiles. These tiles save space and allow for greater flexibility. The tiles offer updated information and can be re-grouped and re-sized according to category or task. Unfortunately this only applies to the Start Screen and not the desktop. Also, there are very limited customization options. So, if you don't like the retro pastel 60's colors, then...uhh. 2. Windows 8 boots over 50% faster than Windows 7 and is generally faster everywhere. It will run better on older and slower hardware than Windows 7 did and Windows 7 was faster than Vista. 3. It works great for tablets! For those that already have a Windows tablet, it will help you do more with less. It will be the wonderland you hoped for. If you already have a Windows tablet, Windows 8 is a must-have. 4. Windows 8 includes an new run time engine called Windows RunTime (WinRT) which is a great new type of program that will run on either x86 or ARM processors. These types of programs are the heart of the new Windows Store which is an app store accessible only through Windows 8 Windows 32/64 programs still run great. All the ease of installing apps on your android phone, but now on Windows! 5. With the new Intel processors AND the speed of Windows 8 it will be possible to run Windows 8 on a x86 phone! 6. 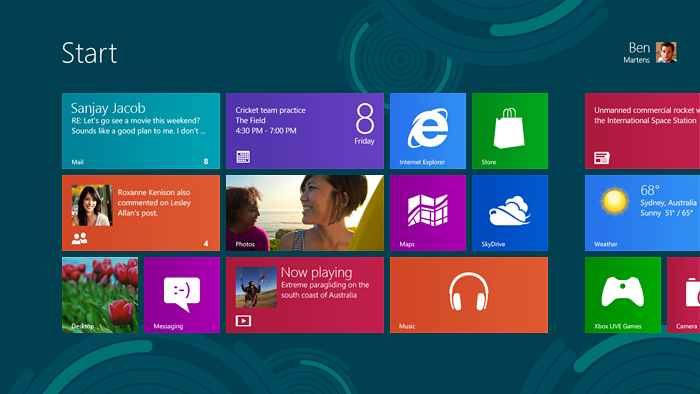 IE10 is tightly integrated with Windows 8 and offers a metro style app version of the browser. (Similar to Android and iOS) This should mean a smoother experience. 7. Windows RT will come with MS Office for the Metro interface. 8. Most keyboard shortcuts still work. 9. Its Cheap ! Windows 8 pro upgrade will only cost $39! Even from Windows XP! If you just bought a computer with Windows 7, then it only costs $15!!! 1. Microsoft is now telling you how you will compute. They are being rather closed about it. This is a first. 2. The desktop is deprecated. Therefore there are few if any concessions to the desktop user. 4. Control panel does not control all, and there are now at least 2 other control panels. They are not interconnected, so you cannot get to one from the other. (that's crazy right there) Notice that in the desktop screenshot (above) that control panel is pinned to the taskbar. That is not default. It was added by the MS employee who made the screenshot. That is an MS screenshot. Even they seem to be annoyed by the interface choices. 6. No start button and/or abbreviated desktop program list. You must get to your programs through the Start screen. No button for that. Either move the mouse to the lower left corner or hit the Windows key. 9. Media Center is now a download only for Pro and above. And you have to pay for it. That interface is now redundant as Metro would have served that purpose easily IF Microsoft had bothered to port the rest of the Media Center functions to Metro, but they did not, so now there is a possibility of 3 UI interfaces on Windows. 4 if you include the command line. 10. Add to the mix Windows RT which is the ARM port of Windows NT from years ago with the Phone 7/Metro interface and a desktop which cannot run classic Windows programs. To add to the confusion Windows ARM tablets can only run Win RT programs. WinRT programs have a desktop and a Metro mode that look identical to Windows 8 on x86 processors, but cannot run the same programs. 11. You will not be able to install Windows RT on your Asus Transformer, Acer, Samsung, or any other Android tablet. You have to buy a new device. Same goes for Windows phone 7/8. So much for the software and hardware being separate. Example 1: Previously to get to Control Panel from the desktop you just clicked the Start Button and then clicked on control panel. Now, you put the mouse in the lower right hand corner, wait for the menu bar to slide out, then click settings, then click control panel. What was 2 steps is now 4. (On android there are still just 2 steps to get to control panel.) Then, there are 2 other control panels as well. Example 2: The desktop has a lock screen that you have to swipe up with the mouse to get out of. Then you can input your password. This makes sense for a phone or tablet, but not for a desktop. Example 3: If, for some reason you get a blue screen of death. Information that was previously posted allowed you to track down the driver or application that crashed the system. That is gone. It crashed, and windows will no longer tell you why. Example 4: Say Malware causes errors on your disk, so you run Chkdsk. It used to tell you what it was doing, now it just tells you when it is done. Who knows what it did? 16. If you have to learn an entirely new operating system just to run Windows 8, then why not learn another operating system? Like Unix, Linux, OSX or dare I say Chrome OS? Before Windows 8, no one would even ask that question. So, Windows 8 is a great idea, but like Vista, it is executed poorly. So far, Microsoft has alienated its vendor partners (with the Surface tablet release) and power users. If they do not make some concessions before release, they will alienate corporate users and their regular users as well. (Except for boomer retirees who check Facebook and watch Netflix videos while listening to Pandora. they will love it.) Yes, I have a lingering suspicion that MS has been over taken by executives of Apple and Ikea. Ikea builds the box and Apple shoves you into it...and MS ordered the hit. The PDA is Dead no wait, its the PC. Yeah, that's it. Or Not. Every three months or so, some pundit is writing an article pronouncing how the "fill in the blank technology" is dead. The PC is dead. No, its the Netbook. No, the laptop. They cite sales figures and analyst projections trying to be ahead of the trends. This ridiculousness is hype for the sake of hype. Technology exists to perform a task for people. It is very rare that any single task would fall out of use. It is common however for tasks to be preformed on other devices or multiple devices rather than just one. The death of a device is more rare, slow and complex than the hype suggests. Technology doesn't really die. It just converges. Our first example is the PDA the most famous being "Palm". It was a digital assistant that fit in the "palm" of your hand. It allowed you to keep all the contact info you already had on your PC and take it with you wherever you went as well as take notes, and keep your calendar appointments. It converged when RIM came out with the Blackberry which did all of that plus added instant alphanumeric pager style messaging. . We now call this "Texting". Followed by mobile email corporations soon adopted this tech in droves. 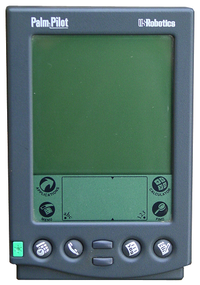 Microsoft came out with Windows CE for the same overall purpose. The first smartphones were either Windows CE, Blackberry or Palm based. They were largely looked at as luxuries rather than tools and adoption was limited due to high prices and complex designs. Apple raised the bar with the iPhone and the rest is history. The PDA did not die then. It converged with communications technology. It became an App. You probably use those features every day on your smart phone. 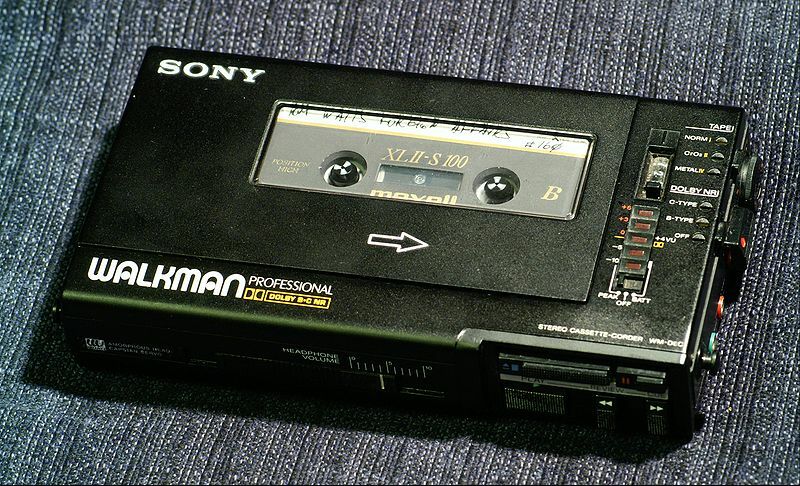 Remember the Walkman? Indeed most people now use their smartphone as their portable music player. The desire for a portable way to listen to audio will always be there. 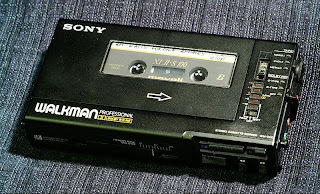 Its function, however, may be built into another device that fills the same portability role as the Tape/CD/MP3 player did. The MP3 player did not die then, it just converged. I assert to you that the Desktop PC is no more dead than the Desk it sits upon. Saying one technology type will replace another is akin to saying that you will replace all of the furniture in your house with one universal piece. Not likely. Not because its not possible, but because its not comfortable. Comfort drives the technology. I read in a chair. I eat at a table, I sleep in a bed. I work at a desk or bench. I do this because these devices are best built for this task. I can read in my bed and sleep at my desk. I do not regularly because it is not comfortable. There is no universal gadget that will replace everything. That's just silly. This Blog is written on my desktop PC, not because I cannot do it another way, but because I would like to keep my neck straight and not have to hold the device while I use it. Also I like my humongous screen, which makes it easy to edit photos without having to zoom in/out all the time. I can blog from my phone and my tablet as well, but it is not as comfortable. Just because I can work anywhere does not make anywhere the BEST place to work. Conversely it would not be practical to have a tablet with at 27 inch screen. That too is silly. Although, Samsung may try it. Tablets have been around for business use for the past 15 years. The IPad is the most famous of course, mostly because it refined the interface and the hardware specifically for tablets, then exploited the possibilities. In short it just performed better. The way one uses a computer will define how useful a tablet such as the IPad is. For a high school or college student, the tablet would a be huge help. Mostly because taking notes on a laptop has always been cumbersome, and battery life is always an issue. For seniors and those that only do light computing, Tablets are a great solution. Tablets are more likely to make paper obsolete rather than the Desktop PC. Having used a Tablet as a Desktop PC, I can say I prefer the regular Desktop PC for serious work. Simply because it makes my body hurt less. Because I am seated....at a desk...with a larger screen that is easier to read. Yes it is that obvious. The best use of a PC then is when you need to work for long periods of time and you want to be comfortable. Remember the PC was originally sold as a business/office tool. It still does that better than a phone or tablet. 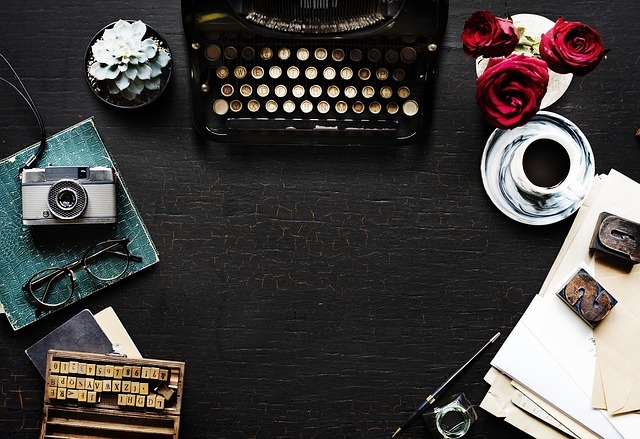 Do paper note pads replace loose paper? No, that's silly. They are very similar but have different uses. But PC sales are down you say. I say of course they are I already have one. And so does everyone else. I have at least 5 PCs not including tablets. It will be awhile before I max out my hardware. Welcome to PC saturation. This is called convergence. We all spoke so hopefully about what that would mean in 1998. Now, as we watch it happen, people are surprised? The point was to ingrate computing into our collective experience. Here is the point: A technology device never rises above its basic use. Put another way: As long as a device is useful, it will still exist. regardless of what analysts say.